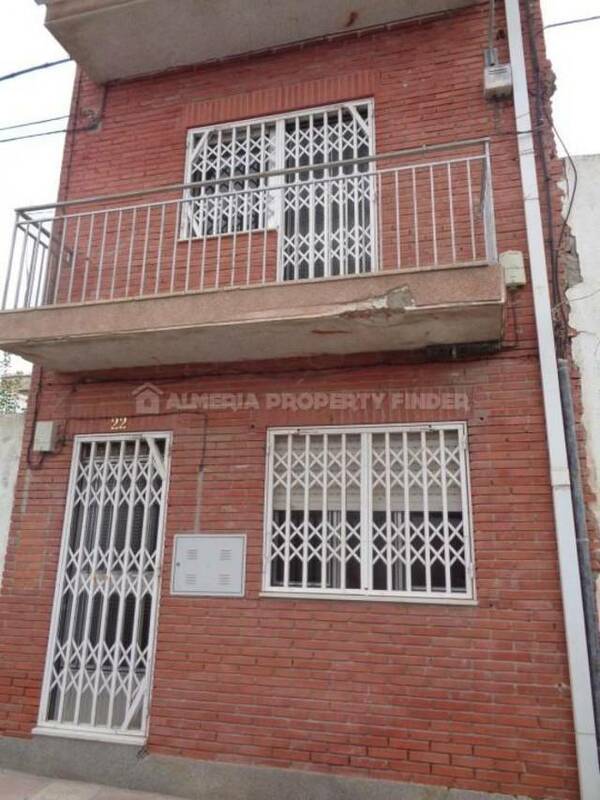 Attractive 4 bedroom town house for sale in Almeria Province, situated in the traditional valley town of Cantoria. This three storey property is habitable but in need of some modernisation and decoration throughout. The front door opens into a bright & airy reception room with an open doorway leading through to another good sized room which has stairs to the first floor. From here, door leads through to a room with double doors leading through to the kitchen, and another door leading into the ground floor shower room. The kitchen is part fitted with a sink, gas hob and oven. The kitchen also has a door leading out to an L-shaped courtyard patio with ample space for a table & chairs. The stairs lead up to a spacious landing on the first floor which gives access to two double bedroom and a bathroom. One of the bedrooms has access to a tiled terrace. The top floor comprises two further large double bedrooms, one of which has a corner fireplace and access to a sunny roof terrace with fabulous views over the town and surrounding countryside. Mains water, electric and sewage are connected, and telephone / internet are available for connection. Cantoria offers a wealth of amenities including shops, bars and restaurants, sports gym and tennis courts, schools, medical centre and a weekly street market on Wednesdays. The town has excellent road communications and the larger town of Albox is 10 minute drive, the beach 45 minutes, and three international airports are also within reasonable commuting distance, Almeria (1 hour) and Murcia and Alicante (2 hours).